Concerns over increased excrement from both dogs and horses posing health risk. Proposed limit Wonnerup East to before 9am. Recommend horse exercise areas be limited to low use beach areas to avoid health risk, environmental impact and user conflicts. Limit Wonnerup West to no further than Captain Baudin Reserve. Reduction in usable area for residents. Suggest off road car park separating horse area and beach area is long overdue. 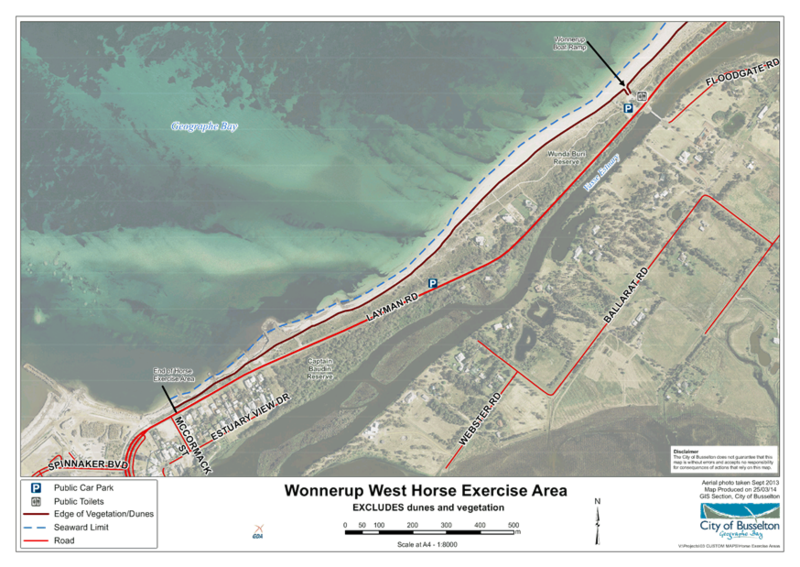 No additional formal beach access proposed. Already lots of dog excrement, increased excrement inevitable with horses too. Objection to Wonnerup West area. It’s a family beach – adding horses would be a conflicting use. Objection to Wonnerup West, Wonnerup East no objection. Conflicting use of horses and children. Already less beach area due to Port Geographe development. People should take priority over horses. Horse owners should exercise their horses on their own properties. Opposed to Wonnerup West area. Proposed Wonnerup West exercise area to stop at Captain Baudin Reserve. Unsafe to use beach with horses running on it. Needs to be some area free of horses for people to utilise. Opposed to Wonnerup East area. There is already a dog exercise area- dogs and horses don’t mix. Beaches shouldn’t be used for business. Conflict of uses (fishing, swimming, horses. Concerns with safety and increased accidents. Horse excrement and people cleaning out horse floats a health hazard. Public safety a concern, specifically insurance. Already less beach area due to Port Geographe development. Should not become overrun with horses. 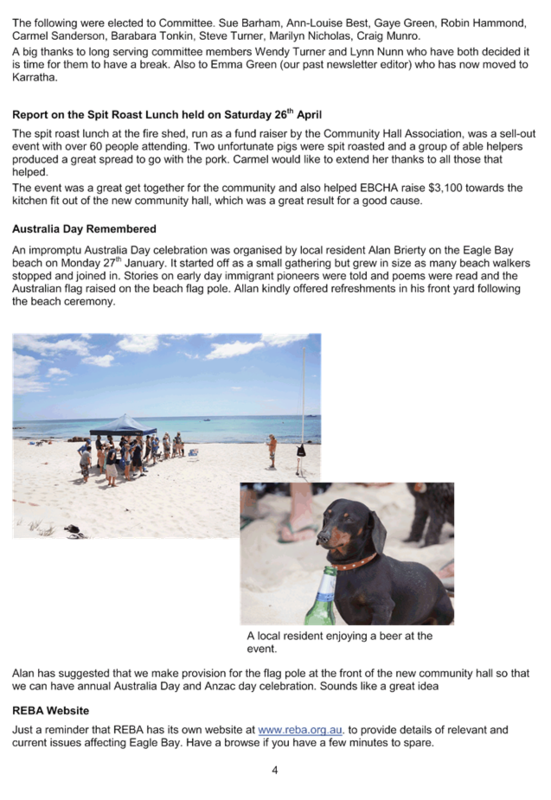 Conflict with the existing dog beach. Health concerns with increased excrement. A conflict of between people and horses. Oppose Wonnerup West area only. Conflict between people and horses. Opposed to Wonnerup West area only. Horses cause damage/ erosion to the beach. No objection to the other proposed areas. On objection to other proposed areas. Conflict with people and horses. Increased density/ population means increased beach users. Beach already subject to erosion. No objection to other proposed areas. Verbal comment via telephone conversation. Proposed signs telling people to pick up excrement. Better visibility for vehicles using this area. Restricted times mean that in winter there’s not a lot of light. Large horse industry in the South West with little room to exercise. Horse owners do pick up horse excrement. Expanding horse community in Busselton. Limited parking at the Quindalup exercise area, especially with general beach users and fishermen. Recommend the use of existing infrastructure to access proposed horse exercise areas. Already less beach area due to Port Geographe development. Once completed this will increase the users of the beach. Oppose Wonnerup East area as this is a 4WD beach- conflict of uses as horses and cars don’t mix. 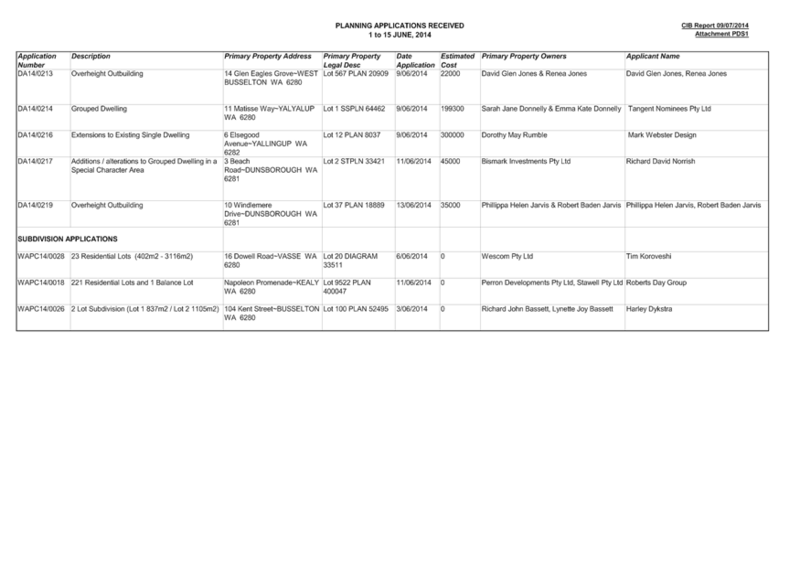 Activities and associated user behaviour on City land are monitored and periodically reviewed. Increased population and visitors to the marina means more people using the beach. Conflict between horses and people. Sufficient room at the Wonnerup East area. Recommend signage upgrade to indicate approved activity on City land. Beach is most accessible/ closest for locals. On objection to the other proposed areas. Concerns over proper parking and access. Supportive of all of the proposed areas. 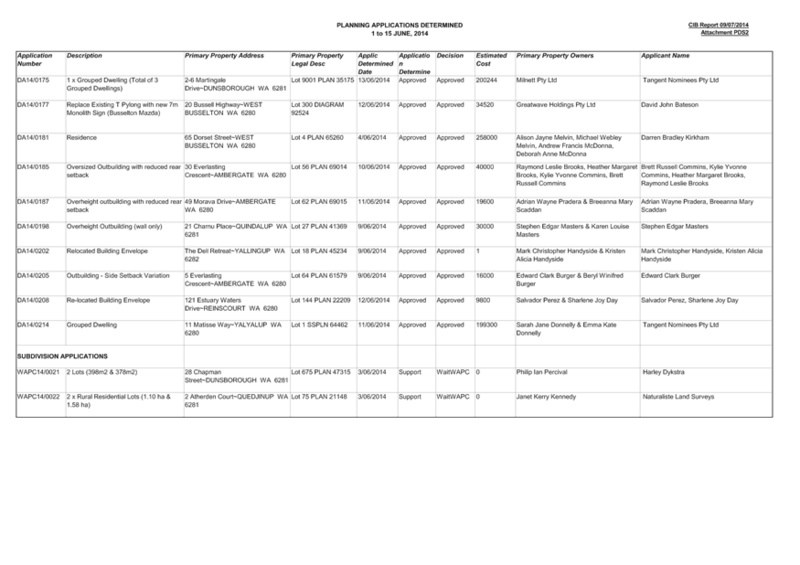 Proposed exercise times conflict with recreational riders and professional trainers. All uses can coexist without conflict. Need better signage telling people to pick up excrement and bins for this purpose. Supportive of all of the areas. Does not want to exercise around dawn and dusk due to concerns of shark attacks. Horse excrement needs to be cleaned up by riders. Conflict between people, horses and dogs. Horse exercise areas are limited in WA. Need to have car parks suitable for cars and floats to safely get in and unload horses. Should be no time restrictions. Better car parking is needed. Horse ownership increases as the population does. Concerned that if Wonnerup East and West are used; there would be no horse free areas to be used by locals. Is a popular area and should be kept for local users with less popular beaches being used for horse exercise areas. Supports the Anniebrook exercise area. Conflict between horses, people and dogs. Health issues due to excrement. Support Wonnerup East as there is less population in this area. Query if the City will enforce regulations/ will there be more staff ? Opposed to Anniebrook exercise area. Health issues with horse excrement not being cleaned up. Safety concerns as the area is accessed from a busy part of Caves Road and crosses over the new cycle path. 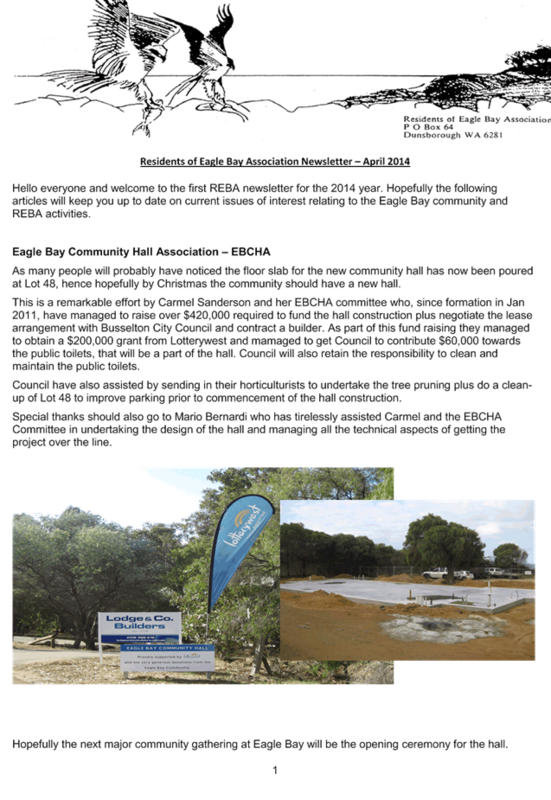 Support the Anniebrook exercise area. Is a regular user of this area. Car parking and path needs to be improved. Would like to see the area expanded more towards Busselton. Supports the Wonnerup East Area. Areas is currently well utilized and is safe. Too many people use this area. 4WD’s on beach already causes conflict. Horses and people should be kept separate. Beach is very narrow and also very popular- not enough room. Safety concerns with horses and dogs and 4WD’s. Need better car parking at Quindalup. Riding on beach not ideal during winter. Request extended horse use times. Conflict with recreational riders and professional trainers. City of Busselton needs bridle trails. Opposed to Wonnerup West and East areas. Beach is already narrow due to erosion. Opposed Wonnerup West and East- to the river mouth. Conflict between 4WD’s, people and horses. Support of the use of the area from the River mouth to the Capel border. Support of Anniebrook exercise area. -in the Short Stay Accommodation Precinct, adding a provision in the DGP making ‘Shop’ and ‘Tavern’ uses incidental to the ‘Hotel’ and ‘Tourist Accommodation’ uses to reflect the primacy of this precinct for tourist accommodation purposes as envisaged by the Master Plan. Whilst development standards for reserved land are generally the subject of discretion, the implications of increased development for parking requirements needs to be taken into consideration. There are approximately 1043 car parking bays planned throughout the Busselton Foreshore area extending between Gale Street and Georgette Street. However, there is a greater reliance on street and shared parking areas. Car parking will also be provided informally during events, where parking is directed to ovals and grassed areas away from activity. As a rough guide, for a tavern we can calculate 1 space for 3sqm of public/ licensed area and for a restaurant it is 1 space per 4 seats/6sqm of public area. Using an average figure of 1 per 4m2, the proposed increase would generate a substantial number of car parking bays plus generation of parking from the al fresco area if within a commercial zoned privately owned lot. Following further consultation with the Busselton Foreshore Reference Group and Councilliors a revised proposal with a reduced ground floor area of 1700m2 plus 400m2 al fresco has been ssupported. This would slightly reduce the demand for car parking. 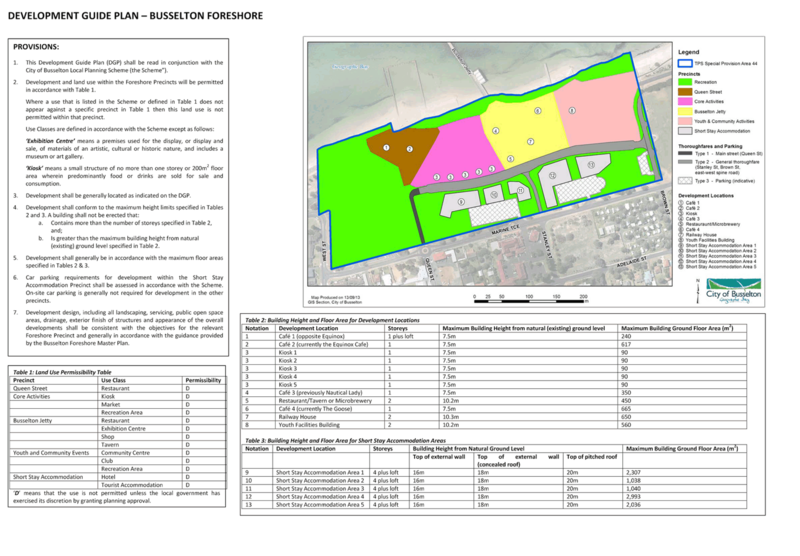 Under Schedule 7, Special Provision 44 of the City of Busselton Town planning Scheme No.20 the DGP is required to be guided by the City of Busselton endorsed Busselton Foreshore Master Plan. Partly uphold to modify the objective for the Short Stay Accommodation Precinct in the DGP Land Use Permissibility Table. The DoW also recommends a provision within the Development Guide Plan calling for the production of an Urban Water Management Plan for each precinct or one UWMP covering the whole of the DGP area. The UWMP(s) should be prepared for DoW endorsement prior to implementation. Preparation of a LWMS and UWMP for this site is not required. .In assessing the application for a clearing permit, the DER found that no significant environmental issues relating to surface or groundwater were raised by the DER’s assessment and the DER found that the proposed clearing was not at variance with their clearing principles. The clearing of 30 trees will not increase the risk of salinity. Await WAPC advice on this issue. Drainage/water management Foreshore area due to deep sand, buildings will need to have soak wells and rain gardens, road runoff will be directed to vegetated areas. This is not required, as the scale of the Foreshore redevelopment is well below the level that would trigger the need for a LWMS. In its decision of 29 January 2014 the Australian Government Department of Environment determined that the proposed Busselton Foreshore redevelopment will be assessed for its impacts on Wetlands of International Importance. 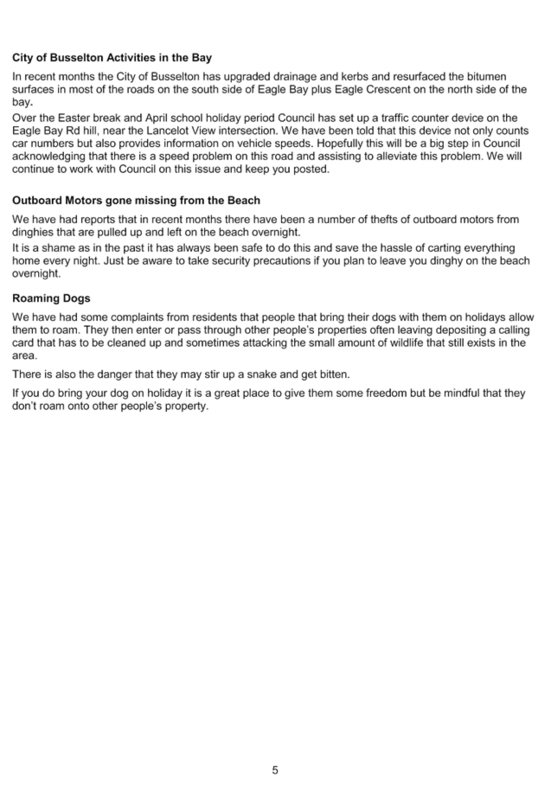 Ln its draft approval notice of 3 June 2014, it did not impose any conditions relating to the proposal’s impact on Wetlands of International Importance. Similarly the State Minister for Environment and DER have issued a clearing permit for the Busselton Foreshore redevelopment without the imposition of conditions relating to this issue. The proposed development is within the WC’s Wastewater Operating Licence Area and therefore will be served. An increase in wastewater flow resulting from the development area will require an investigation to determine a discharge point into the existing system. Being on Crown land the internal system will be private. All these elements should be considered by a consulting engineer. Reticulation mains (under 300mm) and private works are to be funded by the developer. The Civil Engineering Study undertaken as part of the detailed land investigations for the Busselton Foreshore Redevelopment has addressed these issues. Western Power strives to continually improve the accuracy and timeliness of it planning information. Toward this objective, Western Power presents its plans via the Annual Planning Report (APR) and the Network Capacity Mapping Tool (NCMT) In addition Western Power supplies its NCMT data to the Department of Planning for integration into cross-agency publications and planning tools. I invite you to review the information provided via the APR and the NCMT for your area. There is currently no reticulation mains to service this proposed new development area. Hydraulic planning, design and installation of a suitable water supply to this development would be required and should be factored into the development cost. The Civil Engineering Study undertaken as part of the detailed land investigations for the Busselton Foreshore Redevelopment has addressed these issues. The development is able to be connected to reticulated water mains. 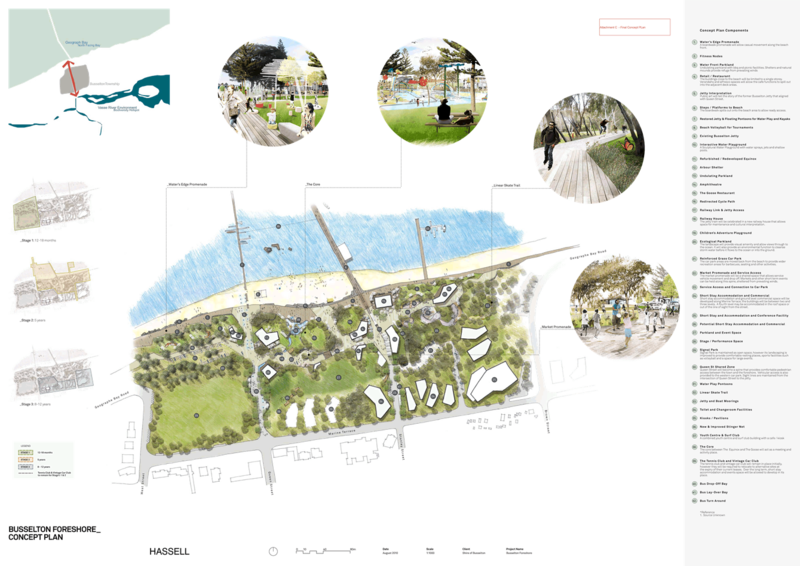 To this point, planning done by the Busselton Foreshore Working Group and concomitant on-the-ground construction have focused on the idea of a family friendly environment in this area. Frequent visits to the foreshore over the Christmas period demonstrated just how successful that focus has become. We are disappointed that the proposed changes would add yet another alcohol outlet to the many already in existence in our community and deplore the fact that it would be located within the heart of this family centred endeavour. If the community feels strongly that it needs more opportunities to purchase alcohol, please let that happen outside the perimeter of our Foreshore. The proposed microbrewery, restaurant, function centre is located within the Busselton Jetty precinct, wherein the objective is to function as a magnet to enliven the central part of the Busselton Foreshore; and enhance the views of the foreshore and jetty, improving the pedestrian experience and development will provide for maximum activation of surrounding spaces. Whilst the Busselton Foreshore Working Group Concept Plan 2010 and BFMP approved in April 2012 did not include a tavern or microbrewery within the Busselton Jetty Precinct the foreshore, this use is considered to be compatible with the restaurant, café and railway house uses within the Precinct. With the increasing population and visitation to the City the current facilities at this location are often at capacity in the peak season. When special functions or events are held at the current facilities there is no alterative food and beverage outlet near the City’s prime attraction. Hence this facility would also provide a facility that is currently lacking in the CBD and foreshore. The suggested 2100m2 footprint, plus additional alfresco space, together with a second storey, is totally out of context with the present overall free flow and accessibility to the public foreshore. The proposed allocated designated area is far too near and imposing to the seafront public area, and I thought such development applications were to be encouraged towards the Marine Terrace area of the foreshore plan. I strongly oppose the tavern/microbrewery licence. Recently, there has been an additional number liquor licences already successful in Busselton and I am totally against the brewing of alcohol on prime foreshore land. Response as per submission 6. Do not support the amalgamation of the Nautical Lady, Kiosk and Tavern/Restaurant sites, a total of 890m2 to create a 2100m2 site plus al fresco area. A two storey building with a footprint this size is out of character, dominating the beachfront which is promoted as a family-friendly public open space. The site to be promoted as a venue to hold seminars/conferences and reception has inadequate parking to cater for the increase in numbers, particularly in the peak holiday/tourist season. The proposal will rationalise café and microbrewery uses in the Busselton Jetty Precinct into one development location, focussed on the proposed intersection of the east-west link road and Stanley Street. From a planning perspective the proposal will provide greater opportunity to activate the Busselton foreshore redevelopment. A future landmark building in this location will be complementary to the site and surrounding commercial, recreational and entertainment uses within the Busselton Jetty Precinct. Development will be guided by the BFMP Design Guidelines for the Busselton Jetty Precinct. This proposal will stimulate activity in this precinct towards the jetty and provide for further integration with activity along the foreshore promenade, the east west spine road and with the Busselton CBD. The impact on the amount of recreational space will only be minimal given that it will replace the existing Nautical Lady tower café site and the eastern-most kiosk into one consolidated site. Officers consider that the reduced ground floor area of 1700m. for the proposed microbrewery, restaurant and function centre with a covered area including verandahs, plus 400m2 additional al fresco is appropriate and will be more in keeping with the scale of other proposed buildings within the Busselton Jetty Precinct on the foreshore than the proposal for a 2100m2 microbrewery, restaurant and function centre with a covered area including verandahs, plus 400m2 additional al fresco. Also refer to Submission 1. 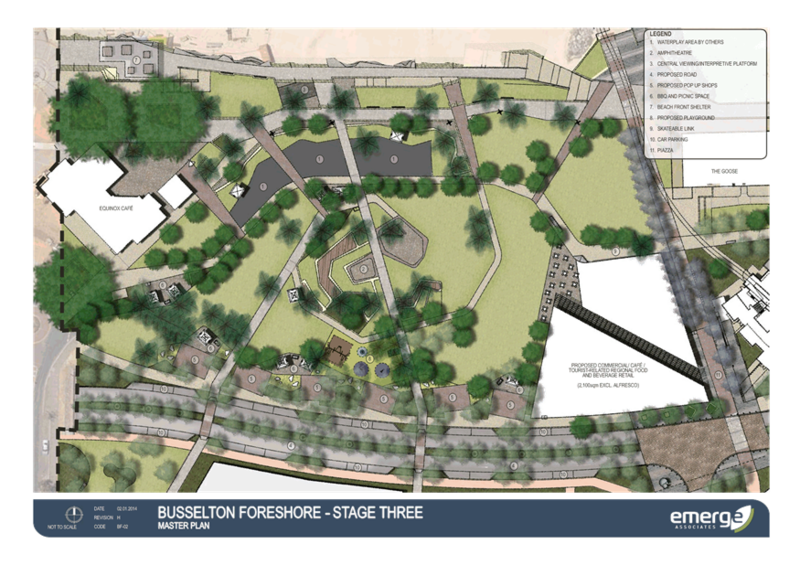 The key principle of the Master Plan is to utilise car parking throughout the Busselton Foreshore redevelopment as opposed to provision of private parking. There are significant numbers of parking bays throughout the Foreshore area. The design approach has been to reduce parking bays in the inner core to enable a greener and more people friendly environment. The amount of car parking to be provided will be increased and the proposal reinforces the concept of having parking outside of the inner core. Two large parking areas that will incorporate retention WRP habitat will be created on the southern side of the short stay accommodation. These car-parks are able to be expanded with parking fitted within the constraints of the existing Peppermint trees and until a detailed design for this area has been completed, the exact number of car-parks is not determined. The east west link road, Queen Street and Stanley Street will be designed as ‘shared streets’ that will be utilised by both pedestrians and vehicular traffic designed for low speed. Limited areas of parking will be available from the ‘shared streets’, providing special needs bays, public transport, coach access and servicing to the commercial tenancies. The reduced ground floor area of 1700m2 for the proposed microbrewery, restaurant and function centre with a covered area including verandahs, plus additional al fresco should reduce the demand for car parking. Object to the height of the short stay accommodation being raised back to 20m. The documents states that the previously agreed 15.8m "may encourage 'blocky type' building design that attempts to maximise development potential yet not exceed 15.8m". This seems a very poor excuse, and controls could be put in place to ensure the building design fits the plan. It is far more likely the height has been increased to make it more attractive to developers. Such a height increase would substantially increase the visual impact of the development. It may be difficult to develop a building with 4 storeys plus a loft that is 15.8 metres in height above natural ground level. In particular, it may encourage ‘blocky type’ building design that attempts to maximise development potential yet not exceed 15.8 metres. That would especially be the case if a developer wished to accommodate compressing land uses, especially at ground floor level, where floor-to-floor heights of up to 4.0 metres may be necessary. What is instead proposed is an approach similar to what is used in the R-Codes where there are controls on height for ‘top of the external wall’, ‘top of pitched roof’ and ‘top of external wall (concealed roof)’. To ensure that developers of 4 storeys plus loft can be accommodated whilst still providing for design flexibility, it is proposed the top of the external wall could be 16 metres, top of pitched roof to be 20 metres, and top of external wall (concealed roof) be 18 metres. 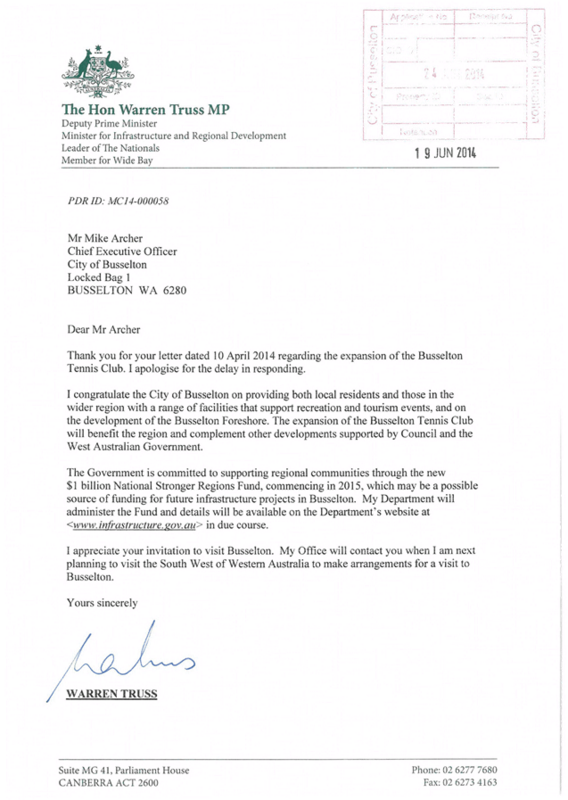 adoption of the BFMP in March 2012, the (then) Commonwealth Department of Sustainability, Environment, Water Population and Communities (DSEWPC) determined that the proposed Busselton Foreshore redevelopment is a ’controlled action’ that requires assessment under the Environmental Protection and Biodiversity Conservation Act (EPBC Act) for its potential impact on Western Ringtail Possum (WRP) habitat and the Ramsar Wetlands. Following discussions with the DSEWPC, State Department of Parks and Wildlife (DPAW), and completion of WRP surveys and reports, the BFMP has been revised to further enhance and protect WRP habitat. The most significant change to the BFMP is the inclusion of a possum corridor and the resultant changes that are required to incorporate this corridor. This proposal has received support from the Commonwealth Department of Environment and formal approval. This is seen as a positive environmental outcome from the Busselton Foreshore Redevelopment. Opposed to 20m high short stay buildings on foreshore, that will be a blight on the family friendly atmosphere. Concerned about parking spaces being reduced unless you are staying in the monstrosities. Taking away our POS. Could build further up the beach. Refer to Response to Submission 9. 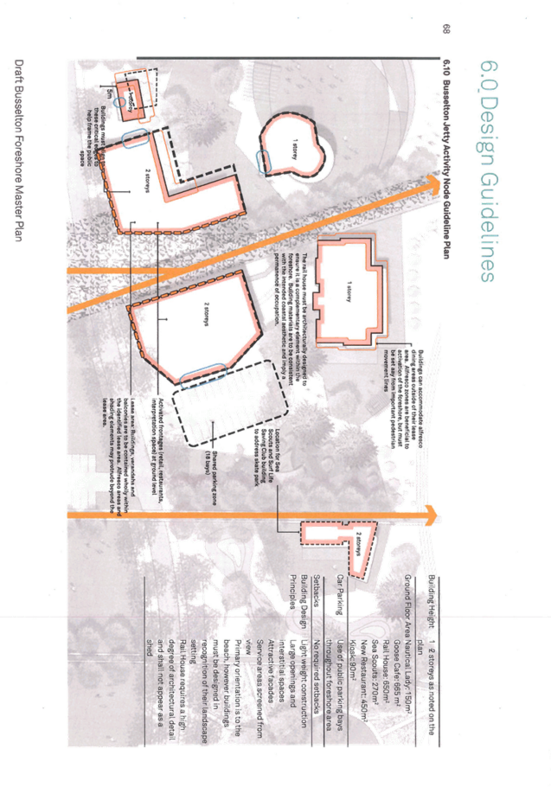 The proposed Master Plan including planting of trees adjacent to the building, additional trees to form a possum corridor and construction of a footpath diagonally through the licenced area results in encroachments. The Council should maintain the function and area of the existing license which provides for parking of 50 vehicles. The possum corridor should be reduced to one row of trees and stop southward progress of the new path to the now southern fence of the tennis courts. As outlined in response to Submission 9. Following discussions with the DSEWPC, State Department of Parks and Wildlife (DPAW), and completion of WRP surveys and reports, the BFMP has been revised to further enhance and protect WRP habitat. The most significant change to the BFMP is the inclusion of a possum corridor and the resultant changes that are required to incorporate this corridor. This proposal has received support from the Commonwealth Department of Environment and formal approval. This is seen as a positive environmental outcome from the Busselton Foreshore Redevelopment. Strongly object to proposed size of 2,100m2 plus alfresco for the new site derived from amalgamation of Nautical Lady, kiosk and Tavern/ Restaurant sites. The total size obtained from the three contributing sites is 890m2, much larger than the Goose restaurant which considered to be a reasonable size. BaDRA members would support a new lot size of up to 1,500m2 including alfresco. Members voiced the firm opinion that a two storey building with a footprint of 2,100m2 plus alfresco would totally dominate the area which has been designed as a family friendly public open space. BaDRA members are not opposed to the concept of a Tavern/ Restaurant on the new site per se, but they strongly oppose the proposal of a microbrewery being built in the middle of what is supposed to be a family friendly public open space. Response as per Submission 6 and 8. Dismiss. Partially uphold in relation to ground floor area of tavern, restaurant site. The foreshore is the wrong place for a microbrewery. We have restaurants and the pub on Marine Terrace. Foreshore plans are great without the microbrewery. Why not retain and rejuvenate the Nautical Lady Tower. Keep the foreshore family friendly. Refer response to submission 6. Object to microbrewery. that it would certainly bring and doesn't the whole area surrounding Busselton have enough liquor venues (far too many in town) for tourists and locals to visit. Any multi storey building is also so highly unsuitable, why, because why do you want to lose the very uniqueness that attracts people to live here(whose concerns should be considered before any developers) and tourists who flock to Busselton because it is unspoilt by such developments. Big sporting and music events that are happening here now do not need such accommodation on our foreshore at the Jetty as there is plenty available from local businesses and resorts. These businesses provide quality accommodation for tourists and sporting events, you must remember that in winter they all struggle to keep staff as there is not a lot of visitors to the area during this time to provide full time employment. This not only applies to accommodation but to all businesses from Cafes, Restaurants, Clothing Stores, Take a Way's and much, much more. Why would you want local business owners and rate payers to suffer for developments that eventually would, I believe, to either be a white elephant or troublesome in the future. Microbrewery inappropriate. Footprint too large. Should be limited to 1000m2. With the short stay the Foreshore will become an extension of the CBD. Areas covered by buildings urban warming occurs. Excessive parking will be required. Strongly object to a microbrewery right near Busselton Jetty. More than enough liquor outlets in Busselton region. Strongly object to hotel or short stay accommodation on A Class reserve or Marine Terrace. Strongly object to a microbrewery in this area, there is insufficient parking facilities in the immediate area and such a proposal would encourage excess alcohol drinking without sufficient transportation facilities. The question is, is this a family friendly area or not? May I also object to the size of an intended alfresco area. This is as big as my house block and much too large. The family friendly area theme is great, let’s not spoil it now. Response as per Submissions 1, 6 and 8. Opposed to a Brewery being built on the space limited prime Foreshore area in the vicinity of our heritage listed world famous Busselton Jetty. One of the main requirements outlined by our Community for our prime central foreshore area was plenty of lawn and shade and space for families and children and all visitors to enjoy this wonderful prime beachfront area. Like most others I applaud Council for the great job they have done to date on stage one of the main beachfront upgrades. However I feel that a microbrewery proposed for the crucially important next stage of our beachfront development, especially one of anywhere near the size proposed, would seriously put at risk the ability for families and visitors and many others to continue to enjoy this prime section of beachfront and would certainly not attract the overall approval of our community that is a feature of the previous stage. I am like many others also very disappointed that this proposal is connected with a plan to demolish The Nautical Lady Tower. This Tower offers visitors and the Community the opportunity to gain wonderful high level 360 degree views of the jetty, the town, and the whole surrounding area. Busselton is very flat and a tower of this type or height is something that our town needs and appreciates much more, than yet another liquor outlet in that general location. Most people I’ve spoken to regarding the proposal to build a large Micro Brewery in the heart of our prime central beachfront area are opposed to the idea primarily like myself, on the basis of location, so I hope that if the majority of submissions also oppose the project, that our Councillors will be guided by the majority and vote accordingly when the matter comes before Council. 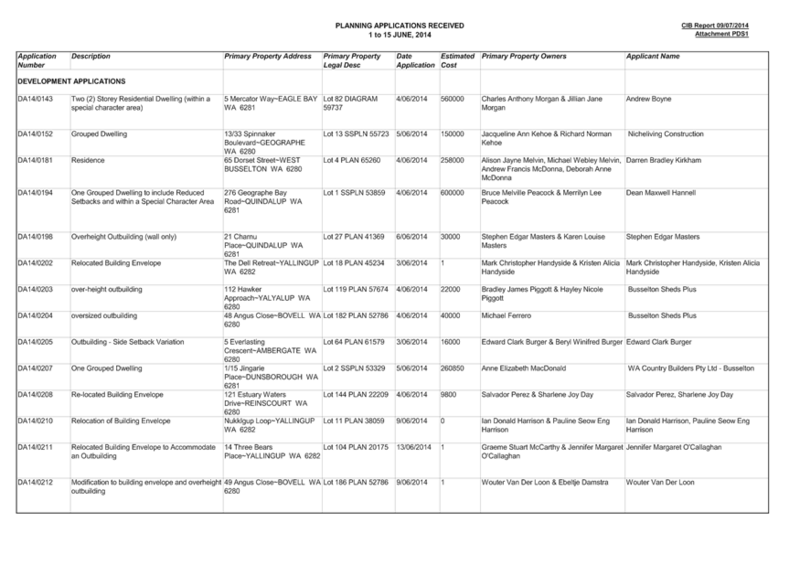 Refer to response to Submissions 6 and 8. Object to microbrewery on foreshore near jetty. Will reduce POS and cause more congestion. Car parking is limited. Alcohol on foreshore is detrimental to children’s use of the foreshore. . Response as per Submissions 1, 6, 8 and 9.. Object to the footprint of microbrewery and reduction in POS. Object to further provision of liquor availability. 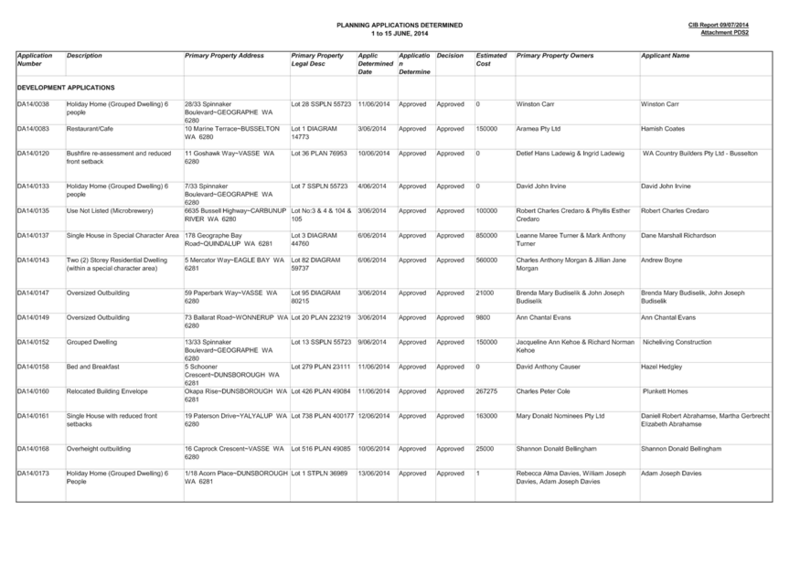 Response as per Submissions 1, 6, 8 and 9. Object to the footprint and height of the microbrewery which will reduce POS which was approved at prior community consultation, seriously affect the aesthetics and limit community activity. Response as per Submissions 8 and 9. Partially uphold in relation to ground floor area of tavern, restaurant site. Object microbrewery on foreshore and impact on community. Not family friendly. Object to size of proposal and two storey inappropriate. Response as per Submissions 6 and 8. Object to microbrewery on this site. Better suited to industrial area. This is the jewel of foreshore sites. Building footprint too large and 2 storey inappropriate. Not family friendly. As owner/director of brewing company and would like to bring his brewing brand to Busselton region. The site is not suitable for a microbrewery and recommend a more suitable site further from the tourist and recreational area. The site is more suited to an outlet for a microbrewery or trendy bar. The use will result in increase in traffic caused through deliveries and collections in an area that should be more focussed on reducing traffic and car free. Light industrial or rural site would be more suitable. Response as per Submissions 1, 6 and 9. The size of the proposed Tavern, Restaurant and Microbrewery plus al fresco is too large and could be reduced to 1500m2. Concern at losing POS and amount of alcohol that would be available. Doesn’t mix with families enjoying POS. Do not support proposed size of the 5 short stay apartment blocks being increased from 15.8m to 20 metres. This needs to be debated by full Council. Inadequate parking to cater for proposed development. Response as per Submissions 6, 8 and 9. No need for a microbrewery on the foreshore when there a number of liquor outlets close by. Concerned for safety of women and young people that may walk past at night. Issues already occur at The Esplanade now. Opposed to the proposed plan of having a commercial space of some 2,100 square metres taking up a significant part of the public open space on the BusseIton Foreshore. I understand the need to have some commercial activities that service the beach goers and other activities that occur in this area but the concept of having: • A micro-brewery in a prime family friendly area is totally wrong. There is already a number of outlets that sell alcohol in the immediate area — another one is NOT required.. • A reception area, - including wedding receptions within this area. This is a blatant commercial activity. This should be built in an appropriately zoned area — not within prime commercial space on the foreshore. 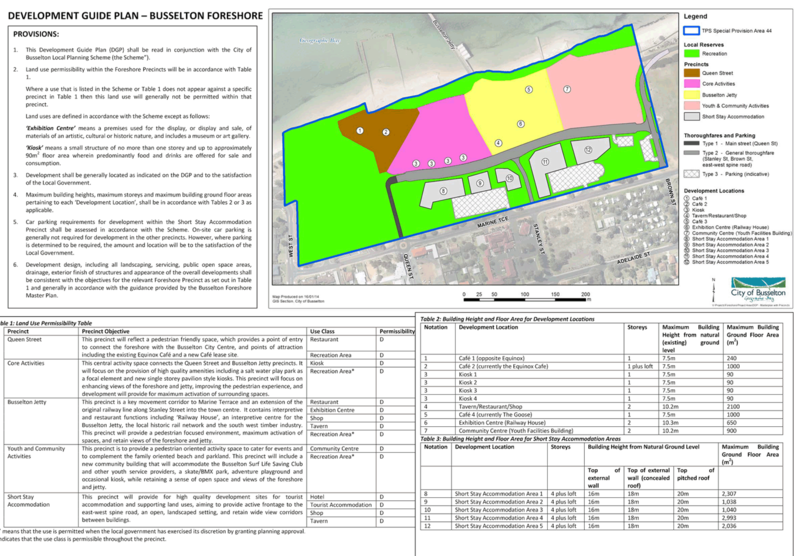 Opposed to concept of 2100m2 being set aside for commercial activity on prime foreshore land. Opposed to microbrewery being included in any commercial activity on the foreshore. The proposed revision (manipulation) of the above Plan to accommodate specific commercial interests to the detriment of the Busselton community is unacceptable. For councillors to properly comprehend the scale impact of the proposed 2100sq m. structural footprint it would be desirable to have the proponents to peg the site boundaries. Further to this it is surprising that professional planners would even consider an open ended area for so called "alfresco" purposes. To complete the degradation of the Busselton community's foreshore, council is being asked to consider a two storey development! Response as per Submissions 6, 8.and 9. The Residents of Eagle Bay Association would like to pass on its thanks for your assistance in ensuring that a sensible and logical decision was finally achieved on the issue of the location for a finger jetty on the east side of the Cape, suitable for use by NVMR for the emergency landing of people injured in boating incidents. Resolving contentious issues where conflicting objectives arise is never an easy task hence our appreciation for ensuring that all parties with an interest or concern had a chance to have their concerns considered at Council debate level. In that regard we would also like to thank Councillor John McCallum who attended various jetty discussion meetings on behalf of Council and allowed a fair and balanced hearing to all sides of the debate presented at these meetings. There were a number of relevant issues that were raised with Council officers, during the two years of considerable consultation on the finger jetty issue, that clearly provide support to the Councillors ultimate decision to vote in favour of extending the existing finger jetty at the old Dunsborough boat ramp as the best option. · At the recommendation of Councillor John McCallum the NVR undertook some time trials in their rescue boats to compare Eagle Bay versus the old Dunsborough boat ramp as potential, suitable jetty locations. From the Swan diving wreck site the time for a rescue boat to reach old Dunsborough was only 3 minutes longer than boat travel time to Eagle Bay. For a boat coming from an area west of Cape Naturaliste the extra boat travel time to reach old Dunsborough rather than Eagle Bay was 6 minutes. The driving time for an ambulance from Eagle Bay to Dunsborough would be at least 12 minutes hence the quickest time to get an injured person to hospital in Busselton is to land them at the old Dunsborough location. 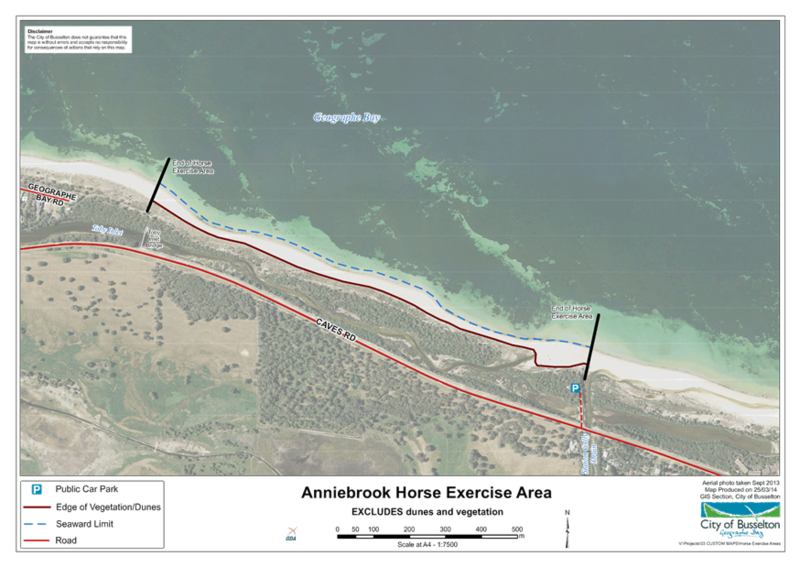 In addition, the existing finger jetty at old Dunsborough already has 24 hour lighting, an existing bitumen access to the base of the jetty for an ambulance and a cleared area adjacent to the jetty where a helicopter could be landed, if required. 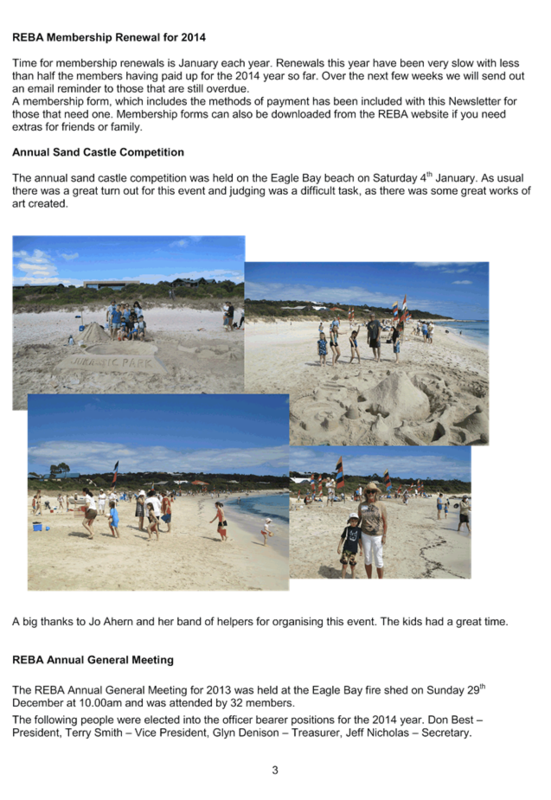 · In December 2012, COB obtained a grant from RBFS to have a wave study undertaken of the coastal region from Wonnerup around to Canal Rocks. Analysis of this data shows that during the summer months of November through to March, safe boating access to a jetty would be approx. 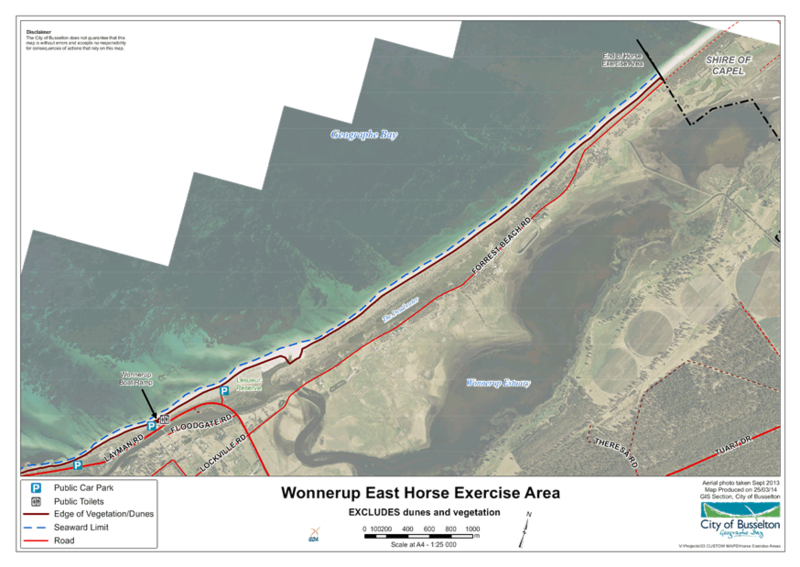 46% of the time at Eagle Bay compared to 63% of the time at the old Dunsborough boat ramp location. During the winter months, Eagle Bay would only be available 21% of the time compared to 50% of the time at old Dunsborough. i.e. from a weather and sea conditions point of view the old Dunsborough location is a far better site for extended periods of safe access for landing at a jetty. · REBA engaged two separate marine engineering consultants to assess the proposal put forward to construct a finger jetty at Eagle Bay. Both consultants concluded that as Eagle Bay is an exposed beach location subject to severe winter storms and swells, a substantial breakwater would be required to protect a jetty structure. Also, due to the seasonal sand movement within the near shore areas of Eagle Bay, a jetty to provide a guaranteed sufficient depth for rescue boats would need to be around twice the length being proposed (i.e. around 120m rather than the proposed 60m). · During the holiday period from Christmas to New Year in December 2013, REBA undertook a survey of recreational beach users to obtain feedback on their views of the proposed finger jetty at the Eagle Bay beach. Those “not in favour” were asked if they would sign a petition against the proposal. Over that short 6 day period 530 signatures were obtained opposing the jetty and of that number who signed, 180 were actual boat owners. Less than a dozen people were “in favour” of the jetty concept and declined to sign the petition. We were not surprised at the overwhelming opposition to the proposed finger jetty, but we were very surprised at the number of recreational beach goers that utilise the Eagle Bay beach. Many came from the Dunsborough and Busselton areas, plus quite a few tourists. 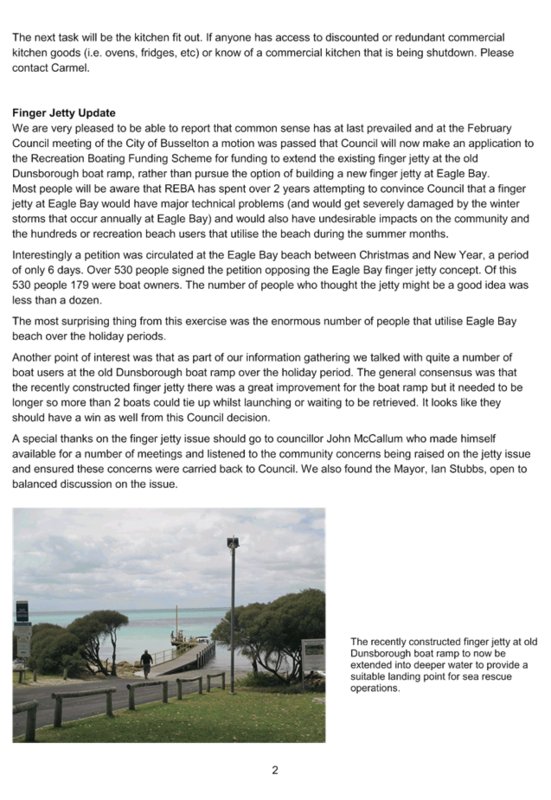 · Also during the holiday period noted in the dot point above, we made a number of visits to the old Dunsborough boat ramp and discussed with recreational boating people using the ramp their views on the existing finger jetty at that location. Almost all thought it was a great improvement for boat ramp users but complained that it was not long enough. Only the dog legged section can be used for tying up boats that have just been launched or waiting to be pulled out and this current length only accommodates about 2 boats. Hence the Councils decision to extend the finger jetty at the old Dunsborough ramp not only services the needs of the NVMR, but also provides an added benefit for recreational boating. · During joint discussion meetings with NVMR they noted that they expected that a finger jetty at Eagle Bay might be used for an emergency situation about once every 5 years and then it would only be possible if the weather conditions were reasonably calm at the time of the emergency. This hardly seems like a reasonable justification for the initial construction cost and ongoing maintenance cost of a jetty for just emergency purposes. It is also worth noting that during our two years of research and fact gathering we checked on the actual reported emergency boating incidents in the Cape Naturalist region and we obtained from the Department of Transport (Marine Division) a list of all the reported boating incidents in the southwest region for the years 2007 through to 2012. These incident reports showed that the vast majority of reported incidents occurred on the west side of Cape Naturaliste and the closest point of emergency response to these incidents would have been Canal Rocks. At a joint meeting with NVMR they also stated that Canal Rocks would be their first preference for a rescue finger jetty but a breakwater protection would be required to ensure all weather availability for a finger jetty at this location. We would therefore urge Council to give serious consideration to upgrading the Canal Rocks facilities, including providing a breakwater protection, as this would greatly improve NVMR emergency response capability and also greatly enhance safety at this popular boat ramp for the recreational boating fraternity. Thanks you again for ensuring our issues and concerns obtained a fair hearing and for allowing us to share the above information with you.